It's Blogger's Quilt Festival time, so head on over and share a quilt that you have made! 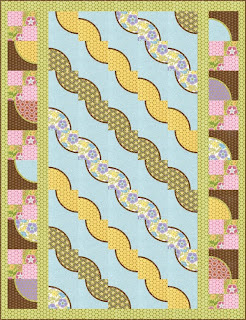 I am sharing "Springtime Garlands" . It is complimentary quilt that I designed for Robert Kaufman, and it is special to me becuase it showcases my first collection of fabrics, Ambrosia. I incorporated fusible bias strips in a way I haven't done before, but I will use so again! Although it looks complex, the quilt is quite simple to make becuase there aren't a lot of seams to match. As for what I learned... well, I learned that what I really love about design (both textile and pattern design) are the unexpected surprises that result from the experimentation with scale and pattern. Sometimes those surprises don't work out that well, but many times they lead us to a more successful, inventive creations. Thanks for letting me share. 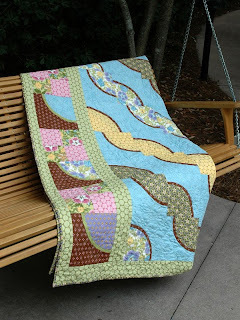 Don't forget to head on over to Blogger's Quilt Festival time to see some amazing quilts! Its a great design to showcase your beautiful fabrics. Love your creativity. It reminds me of waves on the ocean just in different colors! !